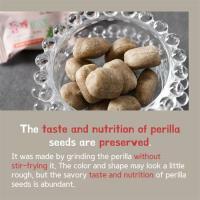 Perilla seed caramel with a mouthful of deep flavor! 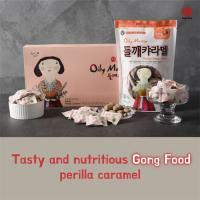 Live a healthy life with soft caramel containing the deep flavor and scent of perilla seed. A bit blackish and rough due to wholly grinding process, rather than roasting the seed. Optimal taste from the soft texture of caramel and deep flavor of perilla. 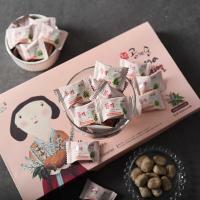 A mouthful of chewy caramel releases deep flavor of perilla seed. Enjoy as nutritious snack for kids, gift for parents, or as weight loss products. 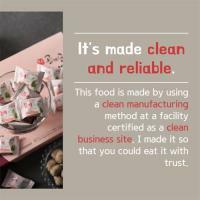 Gong Foods products are manufactured with natural ingredients in state-of-the-art facilities. 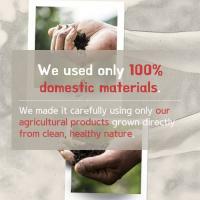 First, we use 100% domestic produce cultivated in a clean and healthy environment. Second, we make benzopyrene-free products using a traditional compression technique, roasting sesame seeds at low temperatures. Third, we maintain a reliably hygienic manufacturing process certified as a “clean business”. which has no buses to pollute the clean water and air. We are an ecofriendly, organic company recognized as village corporation by the Ministry of Interior Affairs. Our products use no artificial dyes, preservatives, or chemical seasonings. 100% of the best domestic ingredients are processed into traditional food and skincare products in state-of-the-art facilities. We are also at the frontline of spreading Korea’s taste and flavor overseas to such countries as the United States, China, Japan, and Singapore. Meet Gong Foods’ food and skincare products, manufactured with the responsibility we feel towards our families. ADEXPOKOREA is a comprehensive advertising agency specializing in one-stop service for advertising, planning and design of media for domestic and overseas PR operations. We are a strong supporter in the battle of the advertising market which is diverse and in-depth publicity ranging from TV, radio, newspapers, magazines, etc. to outdoor advertising such as online, electronic signboard, subway, bus advertisement. The creators of ADEXPO are creating a big idea that will open up the hearts of consumers around the world by becoming a copywriter for language messages, a designer who creates visuals, an AE consisting of marketing experts, an art director and an overseas market development manager. We will do our best to become the best partner in our result-oriented strategy rather than a just do the best partner.